Need help decoding printer terms? Here is a quick list of the most common ones, their meaning and significance. ADF (Automatic Document Feeder): A feature that takes several pages and feeds the paper into the printer one page at a time. AIO (All-in-One): Can be either a small or large printer with fax, scan and copy features; generally for home or small office use. Bubblejet Printer: A popular type of Canon inkjet printer. 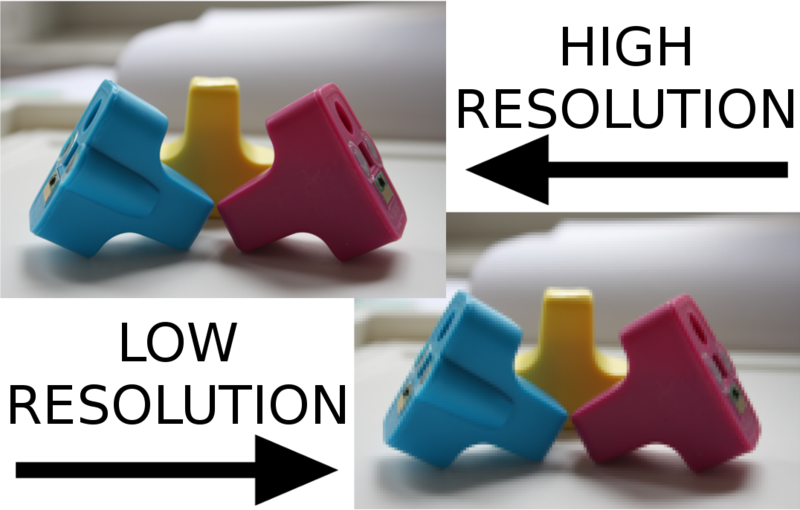 CMYK: Stands for Cyan, Magenta, Yellow and Keystone Black. Printer cartridges are often described by these letters, and the four make up all the colors you see on a printed page. Compatible Cartridge: Refers to the ink cartridge that is not manufactured by the original manufacturer of your printer but will function and work in the same way that an OEM cartridge would. Direct Image Printing: A type of printing in which the images go directly from the plates to the paper. DPI or Dots Per Inch: A measurement referring to the number of individual ink dots that fit into a horizontal and vertical grid of one-square inch. This also refers to the Resolution of the printer, where the higher the number the higher the resolution; a 600x600 dpi is a lower resolution than a 1200x4800 dpi. Duplexing: Double-sided printing. This is connected to Automatic Duplexing, which is the ability to duplex in default. Inkjet Printer: A type of printer that uses sealed cartridges to contain the ink. They spray microscopic streams of ink onto the page to form letters of graphics. Laser Printer: A type of printer that rapidly produces high-quality text and graphics on plain paper. It uses a laser beam across the printer�s photoreceptor to print. Laserjet Printer: A popular type of HP laser printer. Mobile printing: Feature that allows for print jobs to be sent to the printer from a smartphone, tablet or other mobile device. Monthly Duty Cycle: The durability of the printer and how much print volume it can handle in a given month. MFP (Multifunction Printer): A larger printer with fax, scan and copy features; generally used for larger offices. OEM Cartridge: Stands for Original Equipment Manufacturer. This refers to the ink cartridge that comes with the inkjet printer or the replacement cartridges from the original manufacturer. Offset Printer: A type of printer in which the inked image is transferred from a plate to a rubber blanket then to the printing surface. Print Speed: The number of pages or photos that can be printed per minute. Page Yield: How many pages the cartridge can print before it runs dry. Paper Handling: The size or copies or prints a printer can produce; ranges from letter-sized only, letter- and legal-sized, or letter-, legal- and executive-sized (11�x17�). PPM: Pages Per Minute. Refers to how fast a printer can produce average documents. Remanufactured Cartridge: Refers to an OEM cartridge that has been used, but recycled and refilled with ink. Resolution: The maximum number of dots per inch (dpi) that can be printed and measured, both horizontally and vertically. The larger the numbers, the higher the resolution: 72x72 print resolution has less detail and color vibrancy than 300x300 print resolution. Wide-Format Printer: A type of printer that prints sheets of paper between 17� and 100� � also known as a Large-format printer. Printers over the 100� mark may be called Super-Wide or Grand format. 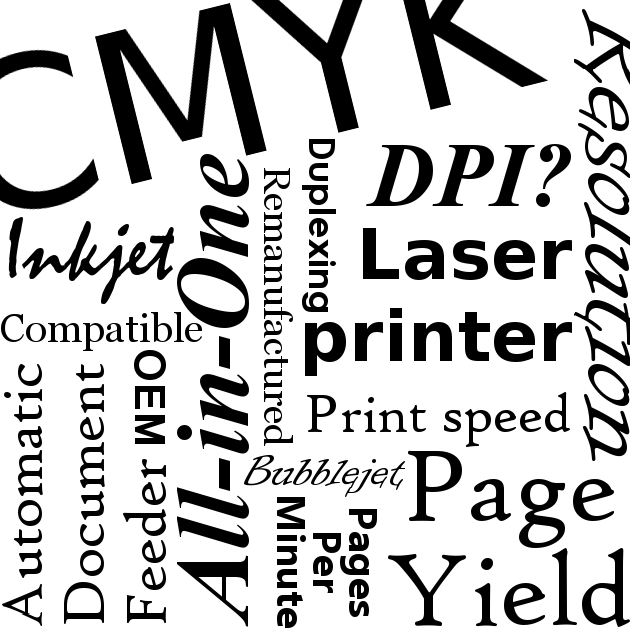 For more help with printer jargon, check out the full list on DNA Print.